A large number of workers in the USA still do not have a long-term job security as it depends on the performance of the economy. Nursing is, however, different from other jobs. Always, there is a high demand for nurses, and as the country's population continues aging, health care sector will even need more professionals. According to Bureau of Labor Statistics, the demand for nurses will grow by 16-19% up to 2022. There might even be a higher demand for nurses in some specialties. If you love nursing, you can choose to specialize in one of these areas of nursing depending on your interests, qualifications and job demands. Neonatal nurses take care of babies born prematurely mostly in intensive care settings. They offer intensive care to premature infants suffering from various health problems. A neonatal nurse closely works with other professionals in health care. They also provide information for parents of such babies as they at first might find it challenging to deal with the realities of taking care of a newborn with fitness complications. You should have a minimum of a bachelor’s degree in nursing for you to practice as a neonatal nurse. Some of the neonatal practitioners join the field with a Master's degree. Before you starting taking care of the infants, you need to go through specialized training or have some experience in serving neonates. Neonatal nurses earn an average of salary of $65,000. Nurse Pediatrics offer health care to infants and young children who do not necessarily suffer from health conditions. It is a specialty for those who love children and developing a relationship with their young patients and their families. Pediatric nursing requires a charming personality to make the children feel at ease. A clinical nurse specialist takes care of patients within a clinical setting. Their role is to diagnose and treat patients suffering from the common health problems that make patients visit a doctor. A clinical nurse will also work with patients with serious and chronic illnesses such as cancer or heart disease. These patients require specialized care. Clinical nurses must have an RN license as a basic. Moreover, they need a bachelor's and master's degree specializing in clinical practice. The average salary for clinical nurses is $67,000. Nurse midwives are advanced practice registered nurses who help expectant mothers through pregnancy, delivery and postpartum to attain health for the mother and child. To become a certified nurse-midwife, you should have a graduate degree in nursing after completing a nationally accredited program then pass a national certification program. Most qualify after gaining work experience as a nurse and earning an MSN in nurse-midwifery. You can practice in at a private, public or military hospital. You can also offer your service at birth centers or a mother’s home. In any setting, you collaborate with physicians. Other career options for a nurse midwife are in administration, education, and research. The average salary for nurse midwife is &61,000. An obstetrical nurse assesses and implements care plans for the women at specific pregnancy stages. Obstetrical nurses can perform cesarean deliveries or other surgical procedures but mid-nurse midwives cannot. It is a good specialty for nurses who enjoy helping expectant mothers. A special training on obstetrics in addition to Bachelor of Science degree in Nursing is a requirement. Obstetrical nurses play an essential role in assisting women during childbirth and care for them after delivery. Some of the professionals in Obstetrical nursing complement their skills in other related areas like labor or neonatal care. Also referred to as NP, this is a professional working under a doctor in a clinical environment. The duties of an NP include examination, diagnosis and prescribing drugs. Due to a shortage of doctors, the services by nurse practitioners are in high demand. In some states, NPs can run their private practice. The qualifications to become a nurse practitioner are to earn a BSN and an MSN then pass a licensure exam. You must also have experience in this field for the credentialing body to consider you for licensure. Licensed Nurse Practitioners earn an average salary of $94,000. Critical care nurse provides health care to critically ill patients mostly in ICUs, hospices and nursing homes. These days, many health facilities have ICUs for specific problems such as burns, heart or lung diseases. A critical nurse can work in a general or specialized ICU. It does not require you to take additional formal training to be a critical care nurse. You only need to study various courses by the organization or hospital where you work. You also need to have a minimum of two-year experience of working as an RN in a critical care unit before taking a critical care certification exam. The average salary for critical care nurses is $61,000. A diabetes nurse provided health care to diabetic people. Since people with diabetes need to change their lifestyle, a nurse has to develop a deeper and longer relationship with the patient. As a diabetes nurse, you can work alone, with a specialist doctor or an endocrinologist. Many people in the US have diabetes, and the demand for diabetes nurses is expected to increase by as much as 39 percent. To become a diabetic nurse, you first become a registered nurse then work at a diabetes treatment facility. You should serve for at least 500 hours in a diabetic facility or clinic and an MSN before applying for an Advanced Diabetes Certification. You get this certification through the American Association of Diabetes Educators. The median salary for diabetes nurses is $75,000. A dialysis nurse cares for patients of kidney problems requiring them to go dialysis regularly to filter their blood and remove waste products. Dialysis nurses should be knowledgeable about different kinds of dialysis including hemodialysis or peritoneal dialysis. They also provide health care to patients after a kidney transplant. You become a dialysis nurse after acquiring a BSN and take dialysis specific classes such as pharmacology and nephrology. A dialysis nurse earns an average salary of $64,000. Nurse practitioners are an integral part for families as they offer on what to do about pains, aches, and illnesses. They examine, diagnose and prescribe medication but under supervision by physicians. Some of them run their practices on their own. You become a certified nurse practitioner after earning Bachelors and Masters Degree then pass an RN licensure examination. You take an RN exam when you have an associate's degree in nursing and start working after that as you study for your Master’s degree that permits you to apply for family practitioner certification. Family nurse practitioners earn a median salary o $94, 407. A gerontological nurse practitioner specializes in taking care of the elderly patients in a clinic, hospital or at home after going through nurse practitioner certification. Gerontological is the replacement term for geriatric nursing. The duties include diagnosis, developing a course of treatment, prescribe medications and perform routine checkups. In some American states, gerontological nurse practitioners can start their private practice. Like other advanced nursing practices, you need a license after earning a bachelor’s and a Master's degree to join the gerontological practice. It also requires some training in caring for the elderly. You must also get certification from American Nurses Credentialing Center. The median salary for this practice is $65, 000. This specialist field is for nurses dealing with the alleviation of chronic pain to improve the quality of life for the patients. A pain management nurse determines the cause of pain and together with other medical professionals work out the best course of treatment. It also involves helping a patient to avoid addiction to narcotics. Anyone interested in this nursing specialty should have a degree in nursing and experience in pain management of at least 2000 hours. The number of aged people in the US is increasing and so is their medical conditions hence job growth for pain management nurses is higher than average. The average salary for this specialty is $67,000. Psychiatric nursing is an important field in helping patients with mental illnesses to deal with their condition through therapy and crisis intervention. It helps patients to learn about the best ways of managing mental disorders in a better way. When you become a psychiatry nurse, you may also help patients to sort out their addiction, mood disorders, drug abuse and anxiety. Before admission into psychiatry nursing, you must be a registered nurse with a BSN degree, education in mental health and continuing training on treating patients with mental disorders. The average salary for psychiatry nurses is $65,000. Trauma nurses are among the first medical personnel to respond to emergency situations. They usually work in trauma facilities, Emergency Rooms (ERs) and urgent care centers. It is a profession requiring much dedication and ability to overcome stress as in many occasions; the patients are a terrible sight. To be a trauma nurse, you should be an RN with BSN degree and few years experience in working in a trauma center or ER and an emergency nursing certification. Trauma nurses have to work long hours and be on call during holidays, weekends or their free time for an average salary of $65,000. Travel Nursing A travel nurse will usually work for a health care or nursing agency covering parts of the US or the whole country. The organizations that hire them to provide nursing care to medical facilities or hospitals and require their service for a short-term. A travel nurse usually steps in for someone else such as a nurse on a study or maternity leave for about 4-13 weeks although the time or service can stretch up to two years. To be a travel nurse only requires education and experience you acquired in one of the nursing specialties. It means you should have an RN license after completing your program and passing the national licensing exam. If you enjoy traveling to various locations, you can be a good travel nurse. The medical provider pays for housing and travel expense. You will also get usual employment benefits such as health insurance, 401Ks and an average salary of around $70,000. Nurse anesthetists are the ones who administer anesthesia to patients before surgery. They also manage care for the patient in the operating room and post surgery care procedures. It is one of the highly prestigious fields of nursing with a high salary. The average earning for this specialty is $1454, 300. The requirement to join the field requires you to have a BSN and experience of at least two years as a nurse before you take an MSN in nursing anesthesia. After the MSN program, you should work in an acute care facility such as an Emergency Room or ICU. Over 17% of nurses in the United States are in the surgical profession making it one of the largest nursing specialties. To qualify as a medical, surgical nurse requires an RN degree specializing in medical-surgical nursing electives. After passing the licensing exam, you need to work for two years as a Registered Nurse and gain 2000 hour experience in medical nursing in three years then take a credentialing exam. Your duties include caring and monitoring patients, helping surgeons in theaters and administering medications prescribed by physicians correctly as a mistake will cause adverse reactions. Medical-surgical nurses earn an average salary of $75,000. An oncology nurse offers special care to cancer patients frequently working personally with them at hospitals, clinical care centers or even at homes. Oncology nurses may have to administer chemotherapy, implement various types of treatments and monitor the overall progress of the patients. To become an oncology nurse, you start by getting a BSN and practice as a general nurse for some years. You can eventually get oncology nursing certification and even earn study for your MSN later on. A medical breakthrough in recent years has led to better cancer treatment methods for cancer and demand for oncology nurses is expected to be at least 20 percent by 2022. Currently, the average salary for oncology nursing is $68,000. An informatics nurse deals with collection, interpretation, and analysis of critical medical data coming to a health facility daily. Another duty is to train other nurses on newly introduced technology for gathering medical data. It is a growing specialty with many career openings as there are fewer nurses with the skills. A BSN degree and experience working as a Registered Nurse is the first step to becoming an informatics nurse. As you practice, take informatics nursing classes which you can take as continuing academic credits. The average salary for nursing informatics professionals is $83,000. A public health nurse provides care for a large population, unlike the regular nurses who serve a patient at a time. Preventive medicine is the primary focus of public health nurses by educating people about health issues and improving community health before the people contract an illness. It is a superb field for a nurse who loves giving community service. To be a public health nurse, you should have a BSN degree and experience working as a regular nurse. You can then go for further training and gather experience in public health nursing. If possible, you can go for an MSN degree in nursing. The government is focusing more on preventive medicine as a way of cutting health care costs hence the public health nurses have a significant role to play. The average salary for their effort is $66,000. Orthopedic nurses have an important role in managing and treating musculoskeletal conditions. They assist patients of all ages through surgery and administering medication while according to the best approach for orthopedic care. An orthopedic nurse should have proper training in this area in addition to a nursing degree due to much involvement in short and long term treatment. It is also their role to help patients and their families to understand their conditions and injuries better. Ostomy Nursing is a specialty for nurses who provide care to patients with an ostomy in urinary and gastrointestinal systems which are necessary for body waste elimination. It is a highly specialized and important area that requires extensive on-job training after completing a four-year degree in nursing. It is common for ostomy nurses to have the training of 5 or more years before they become competitive for the top positions in this field. In addition to providing care to surgical ostomy cases, an ostomy nurse can also provide care for wounds as a result of ulcers, injury or infection. Occupational nurses assess potential risks and develop appropriate action plans in a bid to reduce chances of workplace injuries. The duties might include training workers about precautions to prevent workplace injury and the action to take in the case in happens. Occupational nurses are also hired to develop guidelines to become part of public health policy that protects the health of workers across the industry. Registered nurses specializing in ambulatory care nursing have various skills and diverse knowledge on how to serve patients of all ages with different needs. 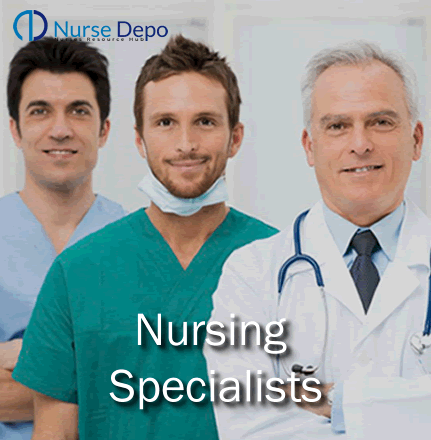 Specialist nurses in this field help people to understand the genetical component of diseases. If you specialize in this field, you will be helping families to understand genetic implications of a disease in a better way. You will also educate and offer ongoing support to families dealing health changes with a genetic cause. Specialists in holistic nursing combine the alternative and traditional philosophies of healing. A holistic nurse addresses personal medical treatment for individuals, help to meet the interrelated emotional, cultural and spiritual needs that support healing. Holistic nursing involves cultivating responsibility and personal empowerment in the sick as well as their family caregivers. The first thing that comes to mind when you hear of nurses are individual in beautiful uniforms working in a clinical setting. There are however some nursing specialties where you are not in the clinical location, at least for most of the time when you work in one of these nursing positions. Health Policy NursingA health policy nurse works at administrative level at private and public organizations to formulate policies that help in improving the health of society. The responsibility of health policy nurses is to evaluate existing health care laws to devise strategies that help in changing public attitude. It is their role to formulate better law when necessary for a college, legislative body or a public health agency. You need a BSN and MSN degree and working experience in general nursing before getting into this field. You also have to participate in health policy residency to gain necessary knowledge and experience on health policy. The average salary in the US is 66,000. The role of any nurse educator is to train nursing students in various areas of nursing education. You may work as an instructor after completing your Associates’, Bachelor or Master's nursing degree program. Due to high demand for all kinds of nursing professionals, it extends to a greater need for nursing educators. To become a nursing educator, you first become a Registered Nurse with at least a BSN. You may also require having an MSN. A doctorate in nursing is necessary for prestigious college teaching positions. The average salary for nursing educators is $65,000, but it varies widely depending on whether you teach community college students or those taking four-year programs at the University. Ever heard of complaints by patients that they did not receive adequate attention at a health facility? Such an issue is in the line of nurse advocate's profession. The role of these professionals is to represent the interests of a patient or family to give a clear distinction of what ought to have taken place in a clinical setting. A nurse advocate creates an essential link between a patient, doctor and the other medical professionals. Since doctors are busy, the patients and their families might not have someone to explain the procedures of medical care, billing and so on. Nurse advocates describe the procedures in layman language and explore alternative treatments for the people they represent. You start by studying for a BSN and becoming an RN. After gaining experience as a practicing RN in the hospital, you should attend continuing education classes in financial and social matters relating to health care. After successfully completing the classes, you may seek employment. The average salary for the position is $57,000. You can also decide to work as a consultant. A nursing research is a practitioner who works intimately with various medical and research organizations to perform clinical studies relating to health. The professional is a scientist studying specific issues dealing with nursing. Some examples of research that nurse researchers can conduct are how to improve the performance of nurses or their working condition to reduce the chances of getting infections. An essential part of this specialty is to write grant proposal than convincing organizations to fund your studies. It is important to analyze this resulting data thoroughly. A BSN then an MSN degree is the academic qualification to become a nurse researcher. These days, it is most likely that a doctorate in nursing will be a requirement. Recruiters also prefer training or experience in clinical studies. The average nursing researcher salary is $90,000. The demand for research is expected to increase by up to 26% by 2022 thus favoring the prospects for nurse researchers. Forensic nurses are part of the legal system. They attend to victims of crime or offenders to gather evidence and prepare reliable reports for use in a court of law. A forensic nurse often gives testimony in court based on the medical findings. Forensic nurses go through special training on how to provide support to victims of violent crimes, abuse, and neglect. If your interest is in this field, you must have a strong background in nursing and excellent knowledge of the law. As you can see, nursing is such a vast profession with numerous opportunities for specialization. There is always chance to do what you level most within the care giving profession.